Joyous feast! Today we commemorate our Holy Father John Cassian the Roman, who is well known for his writings on the ascetic life and his introduction of monastic rules from Scetis in Egypt to the West in the late 300s and early 400s. St. John Cassian was born in the Roman Empire to wealthy parents and at an early age went on pilgrimage to the Holy Land, which so impacted him that he became a monk in Bethlehem, later moving to Scetis to become a disciple of the elders there. After laboring in Egypt as a monk for a number of years the Saint moved to Constantinople where he became a disciple of St. John Chrysostom, who ordained him to the deaconate and appointed him as sacristan of Holy Wisdom Cathedral. When St. John Chrysostom was exiled from Constantinople the city's clergy sent St. John Cassian as their representative to Rome to ask Pope Innocent I to intervene with the emperor on the exiled archbishop's behalf. In Rome the Saint was ordained a priest, and after some time in Italy he left for Provence in what today is southern France. In Provence St. John Cassian founded two monasteries, one for men and one for women, in the coastal city of Marseille. (The men's monastery, St. Victor's Abbey, survives to this day as a Benedictine institution of the Roman Catholic Church.) Through both his labors and his writings St. John Cassian did a great deal to advance the spread of monasticism in the West, and both his Institutes and Conferences are treasured to this day by both Orthodox Christians and Roman Catholics. 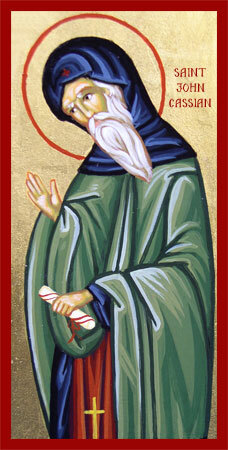 More on St. John Cassian's life can be found here. May his blessing and prayers be with us all!